A new analysis of the contents of lipstick and lip gloss may cause you to pause before puckering. Researchers at UC Berkeley’s School of Public Health tested 32 different lipsticks and lip glosses commonly found in drugstores and department stores. They detected lead, cadmium, chromium, aluminum and five other metals, some of which were found at levels that could raise potential health concerns. Their findings were published online today (Thursday, May 2) in the journal Environmental Health Perspectives. Prior studies also have found metals in cosmetics, but the UC Berkeley researchers estimated risk by analyzing the concentration of the metals detected and consumers’ potential daily intake of the metals, and then comparing this intake with existing health guidelines. Lipstick and lip gloss are of special concern because when they are not being blotted on tissue or left as kiss marks, they are ingested or absorbed, bit by bit, by the individual wearing them, the study authors said. The researchers developed definitions for average and high use of lip makeup based on usage data reported in a previous study. 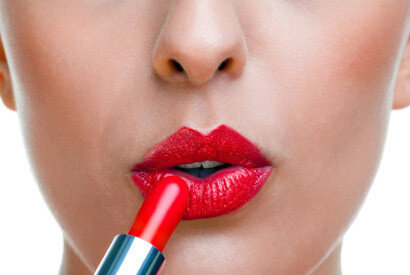 Average use was defined as daily ingestion of 24 milligrams of lip makeup per day. Those who slather on the lip color and reapply it repeatedly could fall into the high use category of 87 milligrams ingested per day. Using acceptable daily intakes derived from this study, average use of some lipsticks and lip glosses would result in excessive exposure to chromium, a carcinogen linked to stomach tumors. High use of these makeup products could result in potential overexposure to aluminum, cadmium and manganese as well. Over time, exposure to high concentrations of manganese has been linked to toxicity in the nervous system. Lead was detected in 24 products, but at a concentration that was generally lower than the acceptable daily intake level. However, the lead levels still raised concerns for young children, who sometimes play with makeup, since no level of lead exposure is considered safe for them, the researchers said. The study authors say that for most adults, there is no reason to toss the lip gloss in the trash, but the amount of metals found do signal the need for more oversight by health regulators. At present, there are no U.S. standards for metal content in cosmetics. The authors note that the European Union considers cadmium, chromium and lead to be unacceptable ingredients – at any level – in cosmetic products. Ann Rojas-Cheatham, director of research and training at the Asian Communities for Reproductive Justice in Oakland, Calif., co-authored the study. The National Institutes of Health and the National Institute of Occupational Safety and Health Education Research Center helped support this research.